Here are some of my top basketball drills for teaching players to shoot a basketball with more accuracy and better form. One of the secrets of great shooting is repetition. Shooting with consistent form over and over and over. There are no shortcuts. 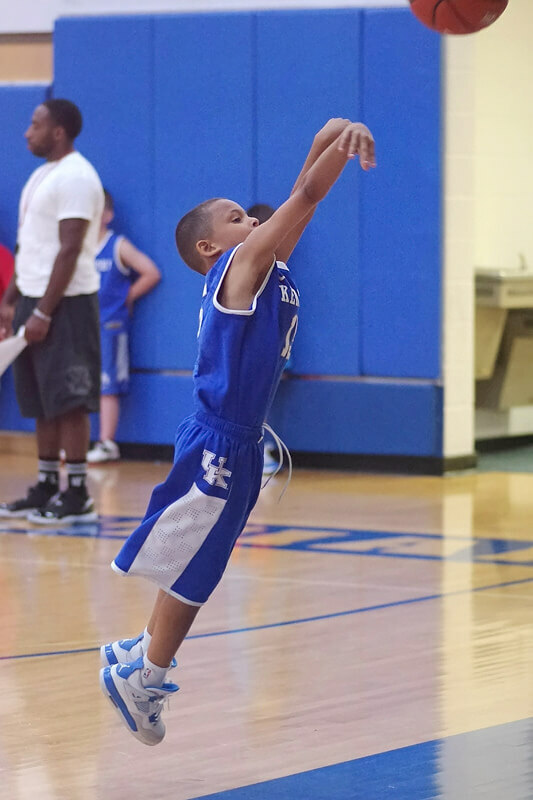 Commit to performing these shooting drills regularly and see how your basketball shot improves. This is a great drill to help strengthen your shooting arm. Lie down on your back, and shoot the ball straight up into the air. Aim for the same spot on the ceiling, basket, or sky every time. Catch the ball and shoot again. Repeat this until you have shot 20, 50, 100 times, or until your arm feels tired. Focus on how the ball feels rolling off the pads of your fingers. Stand close to the basket and shoot the ball with one hand only. Focus on your follow-through, making sure you extend your arm and flex your wrist after every shot. As you get more comfortable and have more success, move back one foot at a time. To make it a little more challenging, sit in a chair while you shoot with one hand. Stand directly in front of the goal. Start in close and work your way back. Your focus is shooting the ball in a straight line, and making sure the ball is coming off your fingers properly. Don't worry if you shoot the ball short or long or if it goes in. You're only concerned with the direction the ball goes. A "success" is a ball that goes straight, while a "miss" is any ball that goes off to the right or left. Start close to the basket. Line up for a shot, but once you get the ball set in the shooting pocket, close your eyes. When you shoot feel the follow through and try to get a sense for where your shot goes - short, long, right, left, etc. Then, open your eyes and see where the ball lands. This will feel very uncomfortable at first but, with practice, you'll start to feel what a good shot feels like. Alternate shooting one shot with your eyes open and then a shot from the same spot with your eyes closed. Pick a spot on the baseline and shoot 5 shots before going to the opposite side. This is the hardest angle in basketball because you don't have the help of the backboard for lining things up. This is a good basketball shooting drill to increase your range. Start by shooting from 1-2 feet beyond your comfort zone. Concentrate on using the correct basketball shooting form with a nice follow through even though you're having to use a little more legs and muscle to shoot farther. Repeat this from other spots on the floor, stepping 1-2 feet behind your comfortable shooting distance. Once you shoot from longer distances, stepping up to your normal shooting range will seem easier. This is a great basketball shooting drill if you're having trouble controlling your distance. Take 3 shots. On the first shot, try to hit the front of the rim. On the second, the back of the rim. And you want the third shot to go in the basket. You don't want to make the first 2 shots; you want them to hit the rim and bounce out. The focus is on controlling the amount of force you exert on your shot. This drill really helps you develop a soft shooting touch. Start close to the basket and aim at the front of the rim. Try to shoot the ball off the front edge so it falls into the basket. It's really important to warm up properly when you're practicing shooting. Here are some top basketball drills to build confidence and help practice the techniques of good basketball shooting form. Start 3 feet away from the basket. Shoot 10 shots from the front, 10 from the right side and 10 from the left. Concentrate on the rim. Check your form after each shot to make sure you're shooting the ball properly. Work your way around the basket taking one shot at 15 different spots. Concentrate on good shooting form. Start in the middle of the free throw line and flip the ball out to the elbow with a backspin so that it bounces back to you. Catch the ball with a jump stop, square up to the basket, and shoot. Flip the ball out to the opposite elbow and repeat. Alternate back and forth from one elbow to the other until you've taken 5 shots from each side. Begin on a block, and shoot a 3-foot bank shot. Rebound and shoot at the same spot on the other side. Cross back across and shoot a 4-foot bank shot. Repeat on the other side. Work your way out to 15-foot bank shots. Start at one block and work your way around the basket, shooting a total of 10 shots. Flip the ball to yourself at each spot so you can practice catching and squaring up. Start at the top of the circle (about 18 feet). Flip the ball out to the wing area. Run and catch the ball on the first bounce, square up, and shoot a jump shot. Shoot on one side until you make 5 shots, and then repeat on the other side. These basketball shooting drills work best if you have a partner, but you can certainly do them by yourself. You just have to chase down your own shots and "pass" to yourself by tossing the ball slightly out in front of you with a backspin so it bounces back to you like you're receiving a pass. See how many shots you can make in a minute. Start under the basket (on the block) and make as many lay-ups as possible alternating back and forth to each side. Use your left hand on the left side and your right hand on the right. Don't use a rebounder on this one. Start under the basket (on the block), and shoot a jumper on one block then the other. Alternate from side to side. Take a shot from one side of the free throw line (the elbow) and then from the other side. Alternate back and forth. Take a shot from the elbow and then hustle down to the baseline on the same side for the next shot. Alternate from elbow to baseline on one side of the court. Then repeat the drill on the other side of the court going from the opposite elbow to the opposite baseline. Start on one baseline and pick a shooting distance that's comfortable for you. Take a shot in order from the baseline, wing, elbow, free throw, opposite elbow, opposite wing, opposite baseline working your way around the basket. You can even add in lay-ups to work on every kind of basketball shot.